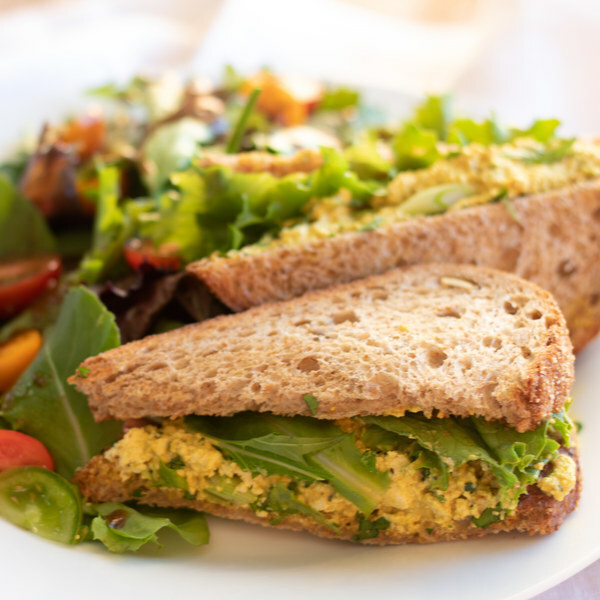 ← Curried Eggless Salad Sandwich with Spring Salad. Peel and mince or press (or press) the garlic into a medium salad bowl. Add the mustard, maple syrup, olive oil, balsamic, salt, and pepper to the bowl with the garlic. Set aside. Halve the grape tomatoes and set aside. Shave the leaves off parsley stems; discard the stems and mince the leaves. Trim off and discard the ends of the green onions; cut the onions crosswise into ¼-inch pieces and set both aside. Halve and pit avocado, scoop flesh out into a medium bowl, and mash with a fork Add Dijon, curry powder, turmeric powder, cayenne, nutritional yeast, salt, and pepper. Mix well. Drain tofu. Transfer to paper towels and gently pat dry. Using your hands, crumble tofu into the bowl with the avocado mixture. Add parsley and green onion to bowl with the tofu and avocado, stir to combine. Assemble the sandwiches by arranging several leaves of the spring mix on half the bread slices and topping with equal portions of the tofu salad and a second slice of bread. Mix remaining spring mix with the dressing and tomatoes. To serve, arrange a sandwich on each plate with the salad on the side. Enjoy!